A solo exhibition of Joanne Aono’s text based drawings based on comparisons and contrasts from life as a twin with bi-cultural experiences. The Twin/Futago drawings are abstractions of the universal dualities we face in seeking both a collective and unique identity. 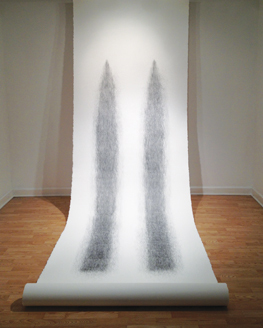 The “Hashi” drawings combine the concept and process of manipulating graphite pencils like chopsticks. Using these two identical tools to make separate unique lines in unison is reflective of twins and their pursuit of individuality. A previous iteration of this exhibition was presented in October at the Lee Dulgar Gallery in South Holland. Images Gallery has provided complimentary use of their space to bring the exhibition to Chicago. This entry was posted in Openings and Events and tagged art, Chicago, Joanne Aono, One & 1. Bookmark the permalink.